Yesterday I wrote about Who Should I Follow?, one of the Twitter apps designed to help you connect with more interesting Tweeple. Today I want to introduce you to Twerpscan, one of the Twitter apps that will help you trim who you are Following and who is Following you. Twitter is full of people who will Follow you for reasons other than why you are on Twitter, and once your account grows closer to that 1,000 Follower mark, it can get tougher and tougher to manage. 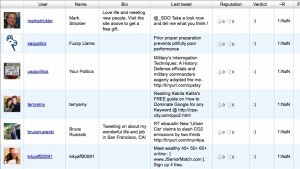 Twerpscan is designed to identify people in your Followers that you don’t really want around, or, if you are someone who uses Auto-Follow for anyone who Follows you, it can help identify who you have Followed that maybe you don’t really want to be listening to. They scan the number of Followers of everyone on your contact list and relate that to the number of people THEY are Following. Your Followers are then ranked based on a ratio of the difference. Ok, that sounds complicated, but the idea is to alert you to Followers who have Follower/Following ratios that don’t fit what you want in a Follower.